Desh is the only one most readable literary magazine for culture lover Bangalis readers. It is also a traditional foremost literary base Bengali fortnightly magazine which has been publishing from Kolkata by Anand Bazar Patrika Group. And it print out on 2 and 17th of every month. Now I want to share a pdf file of Desh on 2nd December 2018 edition. The cover story of this edition are- it is a special story edition, there are many prominent writers wrote their story, like as Shirshendu Mukhopadhyay, Tilottama Majumdar, Samaresh Majumdar, Smaranjit Chakrabarty and many other importent writers. There are fifteen notable stories in this edition. In addition to these there are many regular topics in this issue. Desh patrika's web site is desh.co.in. 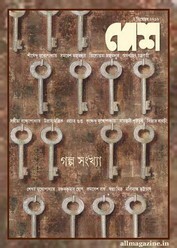 Readers can also collect all old issue of the Bangla Desh patrika. Collect this patrika in pdf / Read online. Dear readers can collect this fortnightly issue- 'Desh 2nd December 2018' in pdf.